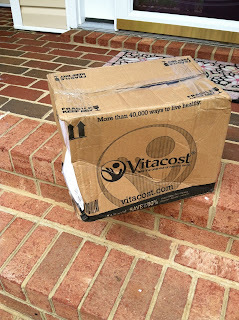 Vitacost was great enough to send me a mono shipment of products to test out and I was in heaven when my box finally got here. Although the package was pretty much destroyed, thanks to UPS,the contents were prefect. Here's a little of what came in the box!! I got the Prevail Vegan Protein Powder, MyChelle Beautiful Age Defense Collection, and Indigo Wild Zum Package, and Power Paks. Two out of three wise men agree on the Indigo Wild Frankincense & Myrrh Zum Bat -- It's an F & M marathon of deep, sweet and woodsy and a whole lot of all-natural goodies for smellin', sprayin', washin', and rubbin'. Get a whiff of Indigo Wild's all-natural aromatherapy products -- infused with good juju, imbued with pure essential oils, endowed with magically aromatic powers. Zum Oil -- Massage in a bottle with shea butter, sweet almond and avocado oils. Zum Mist -- Spray away the funk in the trunk, closet, car, bathroom, and self. Zum Wash -- Natural liquid soap for wash and wear hands and bodies. Two Zum Body Lotions -- A lotion potion of shea butter and meadow foam seed oil. Zum Rub -- Ultra-moisturizing shea butter salve rubs the right way. Frankincense & Myrrh Zum Bar Soap -- Goat's milk, glycerin and heavenly essential oils - wise and woodsy. Frankinfetti Zum Bar Soap -- A clean combo of Frankincense, Myrrh, Sandalwood, and Patchouli. Zum Tub -- Moisturizing sea salt crystals turn a bath tub into a hot tub. There was a lot tucked away in this bag. I opened the package up and it reminded me of college. It smelled like the incense we use to illegally burn in the dorms!! :) I loved the soap and the lotion. They left a great aroma behind and made my skin feel amazing! For nearly three decades, Thorne Research, The developer of Thorne Performance athletic line, and the dedicated team of nutritionists, have been raising the bar to become the industry's most trusted global producer of nutritional supplements. Focus is on scientifically-researched ingredients resulting in hypoallergenic products with the highest degree of purity, quality, and bioavailability on the market. Even the containers are free of harsh chemicals and are xenoestrogen-free. Your skin is just like everything else in nature. As years go by, it can weaken and wear out. But fear not, friends. The bioactive-rich Age Defense products take a stand against aging and provide a visibly younger look. Hi, there. MyChelle here. We think it's high time that skin care products quit it with the harsh chemicals and start fresh with naturally powerful ingredients. Now, you may be thinking, Skin care products that are effective and natural? Really? To chick we're tickled pink to answer, Yes and yes. So now, you really can have it all. At MyChelle Dermaceuticals, we know beauty is so much more than skin deep. It's self deep. We give you what you need to always look forward to looking beautiful - today and every single tomorrow. I have ordered a few other things from the company, vitamins and supplements and they have been stellar to work with. Here's a link to there website Vitacost. Go check them out! !